Much of Artichoke’s work involves designing luxury bespoke kitchens for private homes. Our projects demand not just the highest quality furniture, but also the best quality appliances to go in them. We’ve worked with most of the major appliance manufacturers over the past 25 years, and we know what cuts the mustard in terms of performance and quality. Here are our thoughts on the top major brands delivering at the high quality end of the market we operate in. Sub Zero has established itself as the fridge and freezer brand of choice in the UK for bespoke kitchens in private residences demanding high quality without compromise. Since we started working with them we’ve had very few problems at all from clients where we’ve specified their kit (the only problem we did have was sorted pretty rapidly). Sub Zero has a deserved reputation for the robust workmanship of their products which are used in many domestic environments as well as the professional kitchens of chefs such as Michel Roux, Aldo Zilli and Shaun Rankin. One of the main points of interest is the unique ‘Air Purification’ system built into their refrigerator line which removes harmful gases and odours; a process that was developed initially for NASA to aid food preservation. Additionally, the Dual Compressor system, standard on all Sub-Zero fridge/freezers, is a completely unique feature to Sub-Zero. Wolf, which is owned by Sub Zero, offer a wide range of built-in kitchen ovens, hobs, cook tops gas and dual fuel ranges. A great deal of focus has been placed on precision control of heat to help users deliver professional results. Again, their equipment is extremely well built and we’ve had few problems. It is worth remembering that some of their larger require 3 phase electricity to run and also some seriously powerful extraction which we can help you with. One of their main features is a patented dual stacked burner which offers extremely precise temperature control and precision, making them perfect for melting butter or chocolate on a low heat or high temperature cooking. La Cornue were first launched in 1908 in France by a chef with a passion for new technology. 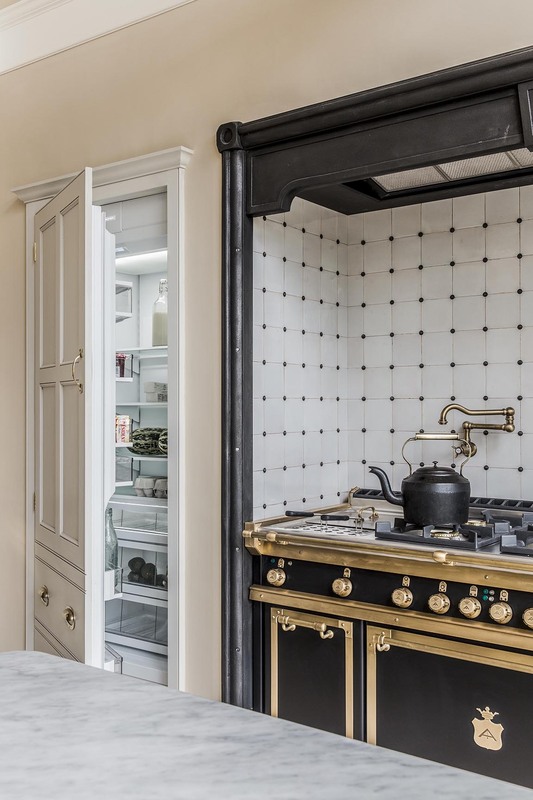 They are still made in France, and each oven is hand-made to order using only cast iron, steel, solid brass, nickel and enamel. Secret to La Cornue’s success is their vaulted ovens which improve circulation and even cooking temperature throughout the oven. Each oven is assembled by hand and only a few hundred are made each year which are delivered to private homes and professional kitchens all over the world. They have a unique look and we’ve used them successfully in both contemporary and traditional bespoke luxury kitchens. Artichoke has installed numerous La Cornue ovens, mainly their Chateaux series; it is well worth visiting their show-room. Gaggenau appliances have been produced in Germany, with all of the engineering precision you’d expect from a German engineering firm, for 300 years, and their experience shows. They now offer a huge range of cooking and chilling appliances aswell as appliances for washing and ventilation. Artichoke has been specifying them for a considerable length of time and their performance has always impressed our clients. Their designs work particularly well in contemporary kitchen design. Electrolux Grand Cuisine are relative new-comers to the domestic luxury bespoke kitchen scene. The backbone behind the new arm of the well established Electrolux brand is the domestication of their existing professional ranges and putting the tools of the professional restaurant within reach of the home chef. We’ve attended a couple of demonstrations of their new range, which includes combination oven, blast chiller, vacuum sealer and induction and gas hobs. The kit was demonstrated by a professional chef and performed brilliantly and looks superb. With strong roots from Florence, Officine Gullo is a relatively young company compared to the strong heritage roots that it can claim. Founded in the 1990s, the companies founder based his first oven in a large range oven made in the 1800’s. The look is renaissance and probably quite polarising, but works well in the traditional and period settings where Artichoke spends much of its time. These are appliances built for professional chefs and dedicated domestic ones, and they are as robust as you’ll find anywhere. Also come with a great range of accessories. If you have questions about appliances, contact Bruce or Andrew on +44 (0)1934 745270 and we’d be happy to give you our thoughts.